2000 - 2003 Honda S2000 Base Convertible 2-Door (2.0L 4cyl DOHC; F20C1). 2004 - 2009 Honda S2000 Base Convertible 2-Door (2.2L 4cyl DOHC; F22C1). 2008 - 2009 Honda S2000 CR Convertible 2-Door (2.2L 4cyl DOHC; F22C1). Top Race Performance clutch covers are built from the ground up as a performance clutch. We do not take stock/oem clutch pressure plates and modify them. All TRP pressure plates are 100% tested and computer balanced. Top Race Performance has been using state of the arc technology such as CATIA (3D Design) and DEA (Finite Element Analysis) engineering, the most advanced design and engineering tools are brought together to reach each customers requirement. What we focus on the most is the Diaphragm spring, which is a key component in a clutch cover assembly. They are made of hard steel and undergo a 6-stage heat treatment process for high clamp load, which provides high TQ/HP capacity. Using stronger drive straps and thicker rivets ensures that no breakage during high acceleration will happen. All pressure plates are tested on our bench machines, which simulate harsh driving conditions. We also check for proper release and the point of engagement. Top Race Performance Stage 2 clutch kit features a High Copper Steel-back Organic lining which provides a smooth engagement but also provides higher TQ capacity and heat dissipation due to the high copper content. This is the preferred clutch for street and track use. Drivability is similar to the stock clutch but with a better engagement due to the copper content. Pedal efforts will be slightly higher because of the higher clamp loads that the pressure plate provides. All TRP clutch discs have spring center dampers to reduce drivetrain shock. The exclusive sprung hub design uses thick-walled retainers that form a pocket around the springs to protect them from popping out, and also resulting in less vibration and more consistent launches. All hubs are heat treated for strength and durability. Our clutch covers have a hardened ductile iron friction plate which can withstand an excessive amount of heat. We use three drive straps and thick rivets to provide extra strength when in action. Best clutch kit for street use and track use. This clutch kit is equivalent to EXEDY stage 1 racing clutch. 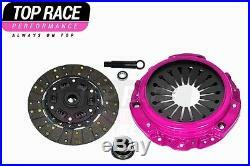 Our TRP Stage 2 clutch kit includes. TRP High Copper-Steelback Clutch Disc (212mm, 24 spline). The Advantage of using our products is that we do not import from China or Korea. All Materials are checked for strength and durability. Must be in original packaging and brand new. Items that have been used, installed, damaged, or altered are non-returnable. Any damaged merchandise received must file a claim with the carrier and not with TRP. We require the parts to be in our facility first to inspect and check the unit in order to send you a new unit. TRP will not send another new unit if the parts are not sent to us for inspection. Allow 2 days for inspection before an answer is given to you. All PUCK CLUTCH DISC(S) need at least 500 miles for break-in. All KEVLAR DISC(S) need at least 1000 miles for break-in. All FULL FACE ORGANIC DISC(S) need at least 200 miles for break-in. The item "TRP STAGE 2 CLUTCH KIT 2000-2009 HONDA S2000 ALL MODEL (Fits S2000)" is in sale since Monday, March 21, 2016.